Based on a short story by American author David Quammen, Walking Out is a father-son movie produced by Alex and Andrew Smith that takes place in Montana’s Crazy Mountains. David (Josh Wiggins) is a urban teenager spending time in the wilderness with his dad, Cal (Matt Bomer), for a hunting trip. As they start their adventure, Cal finds it hard to connect with his son, but a terrible accident will quickly change the dynamic between the two. As they fight for survival in extreme winter conditions, their relationship leads to mutual growth. On opposite sides, father and son have to work together to create memories in a technologically connected world that lacks in creating deep, meaningful connections. When David visits Cal, he has to adapt to his father primitive masculine style. Cal, on the other hand, just wants to pass on family traditions through outdoors activities, and eventually create a father-son memory that will stay with David forever. Independent of what the two believe, being alone together creates a connection they did not predict. The movie was shot almost entirely in the Crazy Mountains. The heavy snow during the movie’s production added some challenge to the project, but it paid off, for the shots in the snow are in accordance to what is going on with our main characters. In the past, when Cal has a problem with his own dad, snow falls to cover an already cold ground. In the present, the snow starts melting as Cal and David seem to start figuring each other out. The weather intensifies the extreme situation they find themselves in, but also plays a beautiful role in the drama. On that note, Walking Out also stars Bill Pullman in flashback scenes as Cal’s father. The passing of family traditions between fathers highlights the idea of generational masculinity, where fathers take their sons into the wilderness expecting a coming of age experience. For Cal, that experience stayed with him to adulthood, so he believes that passing it on to David is essential to his growth. The father-son endeavors in the cold, isolated Montanan backcountry is at the center of the narrative, but to talk about Walking Out and not mention the outstanding landscapes surrounding Cal and David is to forget that to live in Montana is to live inside a National Geographic magazine. In Walking Out, human nature becomes as raw as it gets to remind the audience that, more than hunters, humans are also easy prey for life. Eduardo and Jennifer today. Photo: http://www.chargedfilm.com/gallery/. Eduardo Garcia, known today as the “Bionic Chef,” received an electrical shock of 2400 volts six years ago that completely changed his life. He was venturing through Montana’s back country when he checked a dead bear cub with the tip of his knife without knowing there was a power line under the animal’s body. Eduardo’s girlfriend, Jennifer Jane, was in England at the time when she heard of what had happened. She booked the first available flight to the United States and, while waiting at Heathrow Airport, she contacted the surgeon who was about to perform Eduardo’s first surgery. The doctor warned Jennifer about the surgery’s elevated risks and advised her to say anything she had to say to Eduardo now, for that could be the last time she could ever speak to him again. The incident left Eduardo with several wounds and the title of “bag of bones with a heart beat,” which was the Salt Lake City’s Burn Trauma ICU’s description for his state. Holding on to those heart beats, he went through twenty-one surgeries and, after making a hard decision that could end his career as a chef, had his left hand amputated. The doctors warned Eduardo that keeping his left hand could later bring him medical complications. Besides, his hand would not be half of what it once was. Determined to fight for his life, he lost his hand knowing the decision would have a huge impact on his future endeavors. Jennifer arrived at the hospital and remained by his side during his whole recovery process. Although Eduardo had proven himself unfaithful months before the accident, she chose to care for him because, in her words, “we love who we love.” During his recovery, Jennifer had the idea of filming his progress to later create a documentary on how he overcame this nearly fatal experience. The premise behind the film, she thought, would be to inspire others to overcome their hardships. After receiving many offers to tell Eduardo’s story, they finally decided to get together with some friends in film production to tell a more detailed story than what a fifteen-minute TV interview could tell. Jennifer’s initial plan was to be directly involved in making the documentary, but Charged’s production team realized her significance in Eduardo’s story, and placed her in front of the camera. She wanted the documentary to inspire others through Eduardo’s experience, but everything they had gone through together was also a beautiful love story. Therefore, she gave all the footage she had to the documentary’s production, and became an important figure in the film. Charged offers an intimate view into Eduardo Garcia’s survival story and his quest to reshape himself physically and, most importantly, mentally. The documentary succeeds in not only focusing on the survivor, but also in all the loving and caring people who were by Eduardo’s side throughout his hardest times, including Jennifer. The Art House Cinema & Pub invited Charged’s producer, Dennis Aig, to talk more about the making of the documentary and its impact on the public. ART HOUSE CINEMA & PUB: When did you first hear about Eduardo Garcia’s story? DENNIS AIG: I first heard about Eduardo Garcia’s story in late 2013 while we were still working on our previous documentary film, Unbranded. The principal subject of that film, Ben Masters, stayed at Eduardo’s house in Bozeman, and that is how I met and found out about Eduardo. ART HOUSE CINEMA & PUB: How did you become involved with the project? DENNIS AIG: We were completing Unbranded, and Phil Baribeau, the director of both films, suggested that Charged be our next project. I became part of the discussions to convince Eduardo and Jennifer Jane to allow us to make the film. Once they agreed, we were fully in production. ART HOUSE CINEMA & PUB: Jennifer initially wanted to be involved in making the documentary. When did the production decide that she should be a subject rather than being behind the camera? DENNIS AIG: Phill knew both Eduardo and Jennifer since before the accident. He knew how important she was in Ed’s recovery, and we agreed early on that she would be a significant part of the film. We always intended that Jen’s role as caregiver would be given full weight in the recovery story, since many films about survivors of injury or illness usually give little, if any, attention to caregivers. We also always said this film was a survivor story and a love story. ART HOUSE CINEMA & PUB: Did the production of Charged face any roadblocks? DENNIS AIG: We did need to conduct a Kickstarter campaign to initiate the funding and then find additional people who would eventually invest the remaining money we needed. With the material we shot, the archival material, and Jen’s video work, we had almost too much footage. We needed to work through all of it, and, with our great editor, Tony Hale, figure out the best way to tell the story. We screened six versions for small but diverse test audiences until we found the right balance among all the elements. ART HOUSE CINEMA & PUB: What are some of the biggest highlights you had during the making of Charged? DENNIS AIG: There were several highlights. The great recovery Eduardo made was one them. The resolution of the relationship between Jennifer and Eduardo was another. Eduardo’s reconciliation with Manuel, his father, was as moving in real life as it is on film. The speech for the Bozeman High School students was stirring and revealed the power of Eduardo’s story. I remember watching in amazement as the young students opened up after hearing Eduardo talk about his experiences. He has an amazingly inspiring effect on people, especially those who are in pain and need to talk, however reluctantly, about their suffering. Wherever Eduardo speaks, that place becomes a safe zone in which people, no matter how young or shy, can expose their raw emotions and begin to deal with them. ART HOUSE CINEMA & PUB: What do you want the audience to take out of this film? DENNIS AIG: I would like the audience to see how Eduardo came through an experience that could have destroyed him and found redemption instead. I also hope audiences will see that the love between two people can transcend our normal definitions of a “relationship” to achieve a deep friendship that is truly positive and powerful. Love truly enables us to heal ourselves and others. Charged will be playing at the Art House Cinema & Pub until October 19th. Do not miss the chance to see this inspiring and powerful film. Casey and Jin in front of the Columbus City Hall. Photo: Elisha Christian. Jin (John Cho), a translator living in Seoul, South Korea, travels to Columbus, Indiana after his father, a professor who was studying Columbus’ modernist buildings, has suffered a stroke. There, he meets Casey (Haley Lu Richardson), a young local woman in love with architecture. After Jin’s arrival, they end up meeting and starting a friendship that not only brings them to the center of the story, but also highlights Columbus’ architectural landmarks. The movie is Kogonada’s debut feature film, but for a beginner he manages to deeply explore topics such as death, separation, family relationships, and aspirations in a subtle and unique way. 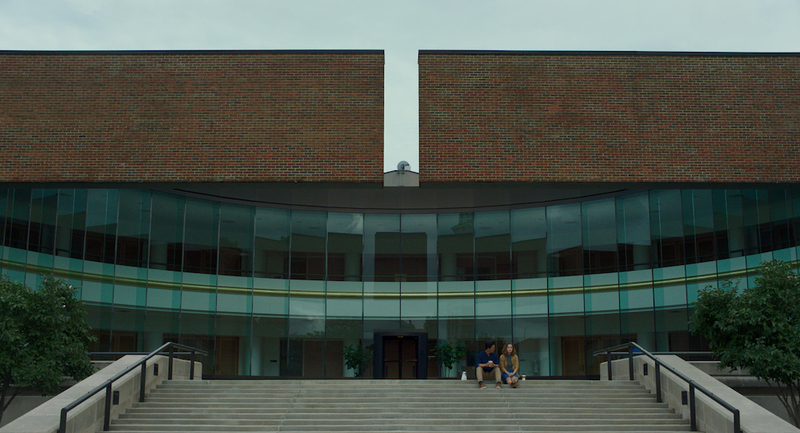 The movie uses Columbus’ modern architecture to create stunning compositions that synchronize with the characters through their meaning. In one scene, Casey takes Jin to see where she went to high school. Jin looks up at the building and gives an insight on its style: “Brutal.” If the ambiance in Columbus were not so relevant, that comment could have passed unnoticed. 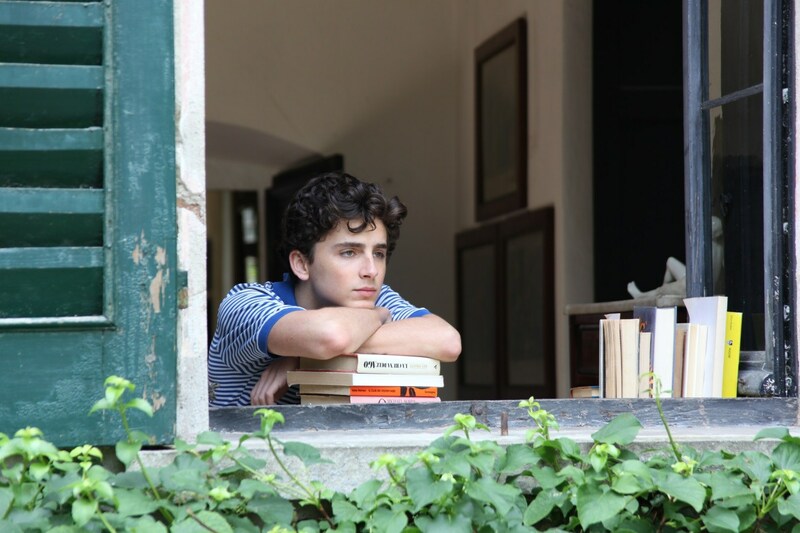 However, as the story unfolds, the viewers come to understand that Casey’s life during high school, as well as the style of the building are connected in their roughness, their brutality. The characters’ romance is another nice touch from Kogonada. Jin and Casey develop a deeper connection that is very different from what is often portrayed in movies. Their affection leaves no place for sexuality, yet their intimacy is acquired through their shared emotions and impressions. When they sit in front of Columbus City Hall, whose architecture features brick beams that extend from either side but do not meet in the middle, the building represents the connection they have, more emotional than physical. For that, it is hard not to fall in love with Columbus, but to praise the movie and not to talk about the cinematographer Elisha Christian would be a mistake. The way he beautifully frames the characters and their surroundings tells more about them than the actual characters sometimes say about themselves. Sensitive in the way it addresses Casey’s and Jin’s personal challenges, Columbus is a passionate story that takes advantage of the city’s impressive architecture without taking away the characters’ spotlight. If anything, the architecture in Columbus is a character too. On April 29, 1992, four white police officers were acquitted of use of excessive force on Rodney King. The court’s decision shook Los Angeles, increasing the racial tensions in the city. Gook, written and directed by Justin Chon, explores this day through the story of two Korean-American brothers, Eli (Justin Chon) and Daniel (David So), and a black girl named Kamilla (Simone Baker), who likes hanging out at their shoe store instead of going to school. A simple, yet powerful moment in the movie, this scene not only displays the true friendship between a young man and a girl, but most importantly, it gives an insight into race relations in America. Entirely populated by Asian, Black, and Latino characters, Gook delivers reflections on racism and violence without even showing up at your door step. Most of the time, these reflections are subtle, like the scene with the word “gook” or when Kamilla is surveilled in a liquor store by its Korean owner, which invokes the Latasha Harlins shooting, when a 15-year-old girl was fatally shot by Soon Ja Du, a liquor store owner who thought she was shoplifting. Shot entirely in black and white, a common technique used in photography to concentrate the attention on what’s in the frame, the movie takes away the attention from colors and centers the viewer’s eyes on the story. The absence of colors and the manipulation of light throughout the film makes the story even more raw than it already is. Menashe Lustig at the back as Menashe. Photo: IMDb. The last Yiddish-language movie I remember watching was the Polish drama The Dybbuk (1937) by Michał Waszyński, so when I found out Art House was bringing Menashe (2017) to Billings, I could not help but get excited. 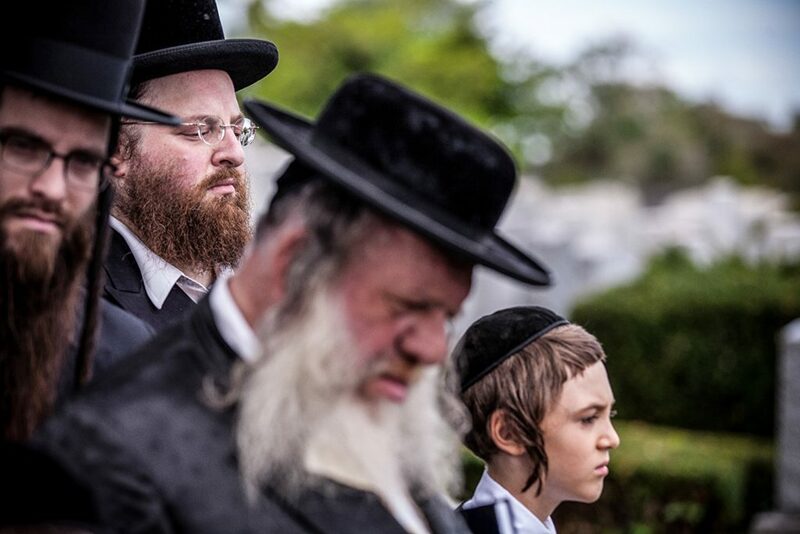 Set in the insular ultra-Orthodox Jewish community in Brooklyn, Menashe (Menashe Lustig), a widower, fights for custody over his son in a culture that believes children need both a mother and a father. Until Menashe marries again, the local rabbi declares him unfit to raise his son, who lives with Menashe’s former brother-in-law’s family. 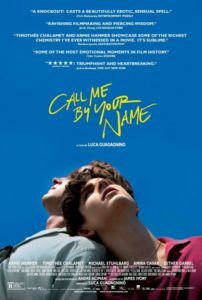 Shot almost entirely in Yiddish, a colorful Jewish language which was nearly wiped out by Holocaust, the movie explores the nature of parenthood and the clash between tradition and the love of a father for his son. The movie has just the right amount of drama, which provides an intimate look at Menashe’s hardships, but it is also filled with the right amount of comedy; the main character has a reputation for being an irresponsible schmuck. He works at a neighborhood market where he often forgets to sweep the floor, he questions the rules of the rabbi, he associates with people from outside the Jewish community, and his low salary prevents him from paying the bills on time. Pressed from both sides of the society he lives in, the Hasidic and the secular one, Menashe is a man of faith with very few hopes. Inspired by the lead actor’s real life, Menashe‘s authenticity is in the representation of feelings without the exacerbated use of words. He is driven by self-doubt and the struggle for his son, which fits with his contemplative personality. Nothing seems to be going right for Menashe. Since that is the reality for many people, the viewer easily connects with the main character, feeling Menashe’s overwhelming sadness as he tries to prove himself to a world that seems to see him as unfit. The distortion of Link Wray’s guitar hit the American air waves in 1958 with “Rumble.” The song was one of the first tunes to use power chords, a technique that had yet to be explored by the rock and roll scene. In the summer of that year, “Rumble” became an instant success. It rose to number sixteen on the charts, despite being banned in several US radio markets under the claim the noisy, distorted sound glorified juvenile delinquency. Link Wray’s innovative use of the electric guitar ended up influencing a generation of guitarists.The distortion of Link Wray’s guitar hit the American air waves in 1958 with “Rumble.” The song was one of the first tunes to use power chords, a technique that had yet to be explored by the rock and roll scene. In the summer of that year, “Rumble” became an instant success. It rose to number sixteen on the charts, despite being banned in several US radio markets under the claim the noisy, distorted sound glorified juvenile delinquency. Link Wray’s innovative use of the electric guitar ended up influencing a generation of guitarists. Rumble: The Indians Who Rocked the World is an enlightening documentary about Native Americans’ role in the evolution of contemporary music. It tells the story of contributions made by Native American musicians to the rise of blues, rock and roll, and pop music. These musicians include Mildred Bailey, Jesse Ed Davis, Buffy Sainte-Marie, Randy Castillo, and, of course, Link Wray. Directed by Catherine Bainbridge and Alfonso Maiorana, this movie presents an overlooked chapter in music history. From the father of delta blues, Charley Patton, to one of the most celebrated musicians of the 20th Century, Jimi Hendrix, this documentary provides a list of influential artists whose Native American backgrounds often lacked the due consideration by their fans and the media. For example, during Woodstock, Jimi Hendrix wore headbands and other Native American-styled clothing. Jimi’s sister says he did it to honor his Cherokee grandmother. However, at that time, most fans saw his style as part of the tribal trend in hippie fashion. The radio ban on Wray’s music, or the disregard for Jimi Hendrix’s Native American roots may not have been directly related to the blatant discrimination occurring in the Fifties and Sixties, but it sure resembles the time when the government outlawed music by Native Americans. Although this documentary covers many prohibitions that targeted Native American culture, Rumble triumphs by not victimizing Native Americans. It leaves viewers feeling inspired rather than sad, and with “Rumble” echoing in their heads. Dummm dummm duuuuummm. Lady Macbeth (2016) is set in rural north England in the mid-19th Century. The movie’s opening scene shows Katherine’s (Florence Pugh) face covered by a white wedding veil, looking back, as if glancing at the viewer. The lack of importance in Katherine’s surroundings gives her a strong sense of presence, yet it foreshadows the loneliness of her coming marital life. Prevented by her husband from leaving the house, Katherine is trapped in a suffocating environment where she is seen as a mere adornment and child-bearer. Alexander (Paul Hilton), Katherine’s much older husband, does not show any sexual interest in her. When he leaves the house for reasons unknown to Katherine, she ends up having an affair with one of the men who works on the land, Sebastian (Cosmo Jarvis). Florence Pugh as Katherine in Lady Macbeth. Photo: IMDb. 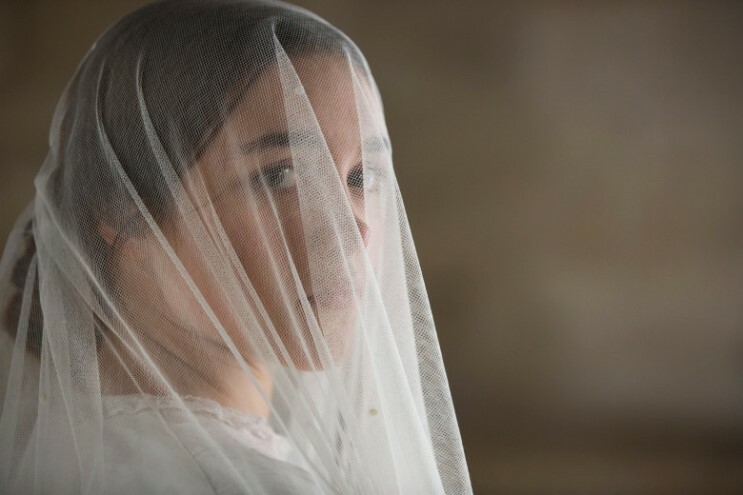 The story may remind viewers of Madame Bovary, but do not fool yourself, for Lady Macbeth takes on a very different, dark course. Based on Lady Macbeth of the Mtsensk District by Russian writer Nikolai Leskov, the movie can go from quietness to turmoil in a very short period of time. Lady Macbeth‘s narrative does not rely too much on dialogue to tell Katherine’s story. The setting, lighting, and solitude around Katherine’s environment can be more expressive than words. The lack of cheerful tones in the house creates a dreary habitat, which focuses the attention on Katherine, and at the same time indicates a state of boredom. The constant silence in the house turns Katherine’s own breathing into the movie’s soundtrack, showing how suffocating her life is in that patriarchal social system. At this point of the movie, there is no way out; the viewer is also stuck in the house with Katherine. The way Katherine finds freedom to love Sebastian is by suppressing any compassion and taking down anyone who seems to threaten her affair. When she starts taking action, the viewer understands the reference to Shakespeare’s Lady Macbeth, a woman conflicted between masculinity and femininity in a time where being ruthless was seen as a male attribute. Katherine is a modern character lost in a rustic, old environment. The cinematography complies with that, adopting an approach not often used in period dramas, which brings us closer to Katherine. The movie is William Oldroyd’s debut feature film, and Alice Birch’s debut as a screenwriter. As for the actress Florence Pugh, one thought follows the viewer around: “Who is this girl and why have I not seen her before?” Her performance as Katherine creates a dense mid-19th Century femme fatale who leads her lover – and the viewer – into deadly situations. As the story unfolds, Katherine’s silence is replaced by the silence of a speechless audience. Vulnerability often leads people to seek help from others, but what few realize is that help can also come from within the self through the making of art. Art has the power to expand one’s abilities beyond those given by nature, compensating for a certain innate weakness of mind or body. In Maudie (2017), directed by Aisling Walsh and written by Sherry White, the colorful, vibrant paintings of folk artist Maud Lewis transcend her natural physical limitations to find a place in the viewer’s heart. 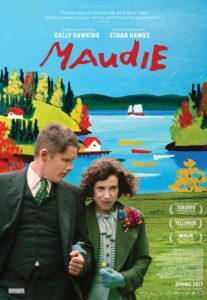 Sally Hawkins gives life to Maud Lewis, a self-taught, Canadian painter with rheumatoid arthritis, struggling to prove herself capable despite her crippling appearance. When Everett Lewis (Ethan Hawke), a fish peddler, decides to find a woman to help him with the housework, he meets Maud. She moves in to work for Everett, whose toxic masculinity makes it hard to understand the attraction Maud soon develops for him. 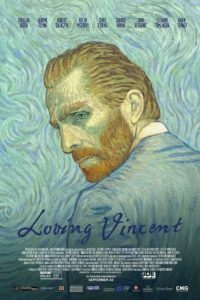 Emotions are stirred up in this biopic film as Hawkins delivers an outstanding performance as Maud. The actress manages to portray the troubled physical limitations of her character, while showing a glittery charismatic side of Maud’s personality, whose life’s surroundings are not so bright and colorful as the life she portrays in her paintings. We should not be surprised if Sally Hawkins, who was recently nominated for an Academy Award for best supporting actress, gets nominated for best actress next year for her role in Maudie; Hawkins’ transformation into Maud will not go unnoticed. Ethan Hawke’s performance also causes an impression, for we find it hard to sympathize with his character, an abusive Everett. “Let me tell you how it is around here,” Everett says to Maud after she starts living with him. “There’s me, them dogs, them chickens, then you.” But, Everett’s traditional views soon collapse as he finds himself sweeping the front porch while Maud slowly starts selling her paintings and becomes the provider. The cinematography in the story immerses the viewer into Maud’s artistic solitude. The frame-within-a-frame shots constantly puts Maud looking from behind windows, which adds a loneliness in the already lonely rural environment. Yet, the windows present life already framed right in front of her, just expecting to be painted. The eyes might be the windows for the soul, but in Maud’s creative process the windows are the ones serving as eyes for life. In Maudie, we find the inspiring story of a woman whose limitations never prevented her from comprehending how beautiful life can be. You might not know about Maud’s work or history, but you will most likely walk away from the movie theater idolizing a new artist. Maudie may become one of the most touching movies you might see this year. Just be sure to bring your own tissues because you may eventually drop a few tears – or just grab the closest napkin on the Art House’s bar.